Our secure enterprise software ensures both accountability, and adherence to our standards of service quality. 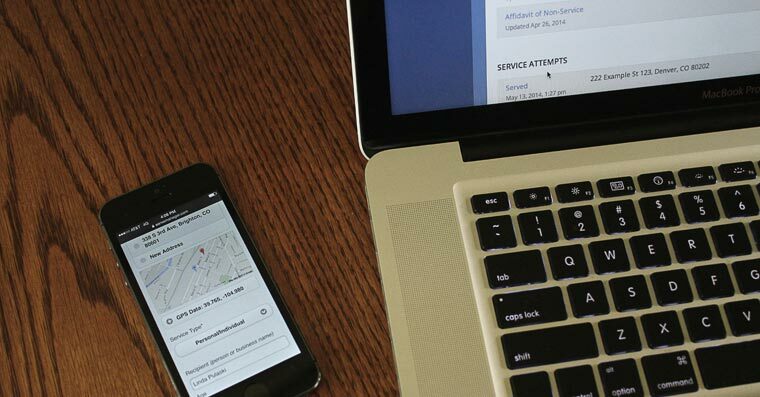 Servers utilize mobile devices in the field to geotag and timestamp attempts, upload service photos, and complete and transmit digitally signed affidavits, all in real time. Our SaaS product enables clients to request and complete work in whatever way best suits their needs. Log in to remotely create jobs, upload documents, check job status, input a new service address, download affidavits, and so much more. Or send an email, fire, and forget. We offer as much or as little collaboration as our clients want/need. Is your current process server making the best use of available technology?